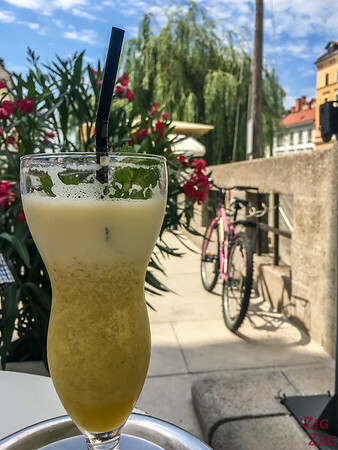 Plan your trip with my selection of the 23 best things to do in Ljubljana - Best views, monuments, fun activities, free things to do, tours... Visit Ljubljana old town and beyond! 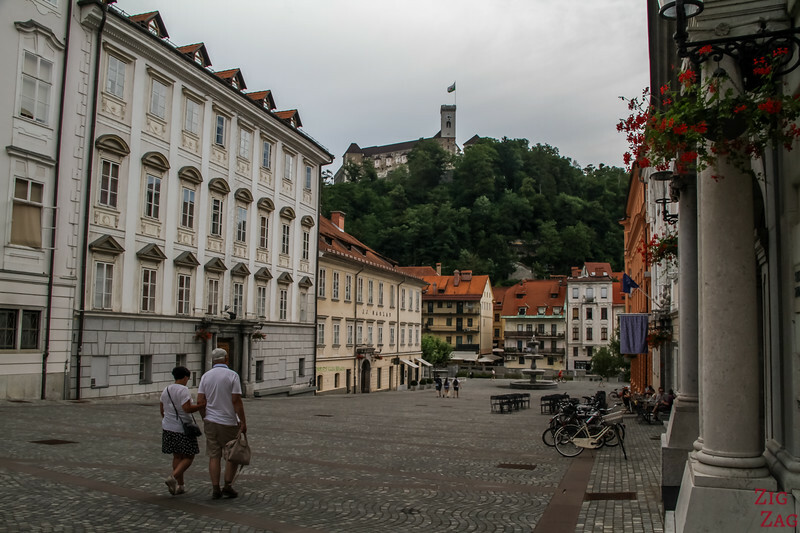 The complete map with the locations of my selection of the best things to do in Ljubljana is included in my eBook. 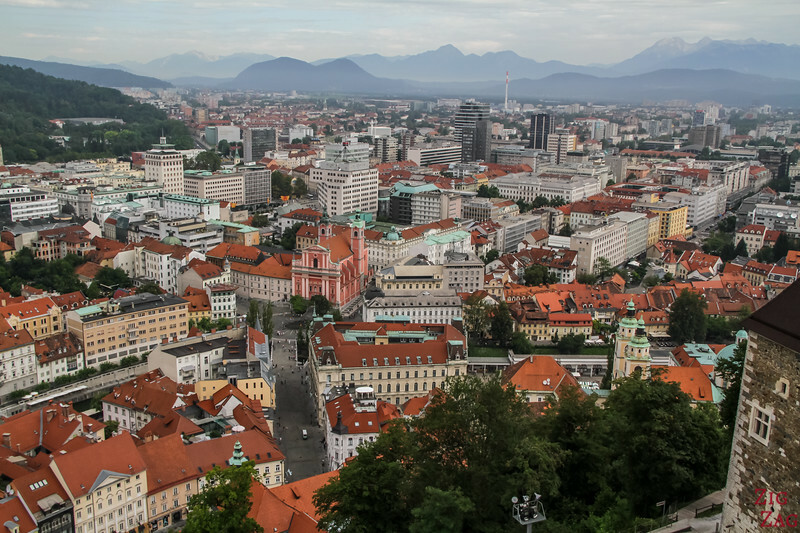 My absolute favorite view in Ljubljana is from the rooftop bar of the Skyscraper building. It's actual name Neboticnik means Skyscraper. It does not seem that tall today, but when it was build between the two World Wars it was, hence the name. From the outside it looks like an office building. Don't be scare enter, and take the elevator to the top floor with the restaurant. You then climb an extra staircase to reach the bar which has an outside terrace all around the tower. This Is excellent as you get views of Slovenia in all directions. But the best one is with the old town, and the castle. The next best views was from the top of the tower in the Ljubljana Castle. You must purchase an entry ticket that includes the tower. Beware that you need to clim 120 steps to the top with part of it on a dizzying spiral staircase. It is great because you really are right above the old town and you cna see the shape of the castle from above. But, of course, you don't have the castle itself on the panorama. For a ground level view that includes the castle, I recommend the Congress Square on the west side of the river. It is a large open area with nice buildings such as the philharmonic and the university building. And you can see the castle overlooking the city. 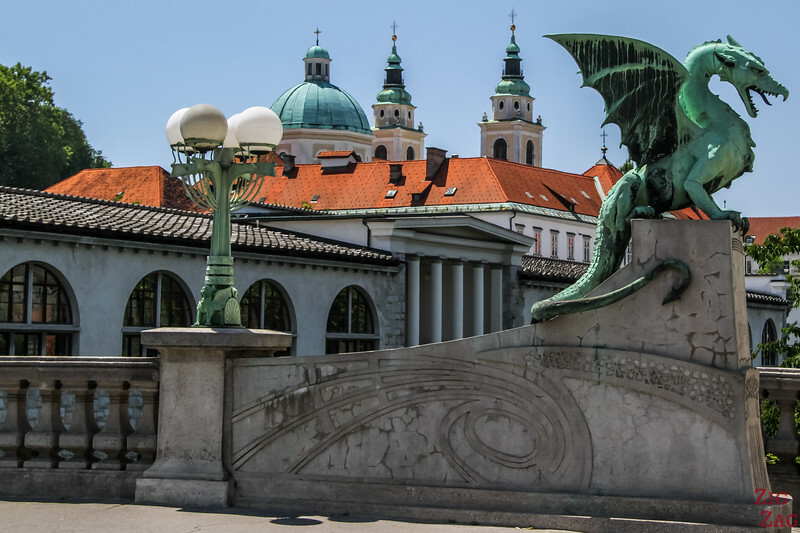 One of the 2 most famous bridges in Ljubljana is the Dragon bridge (Zmajski most). 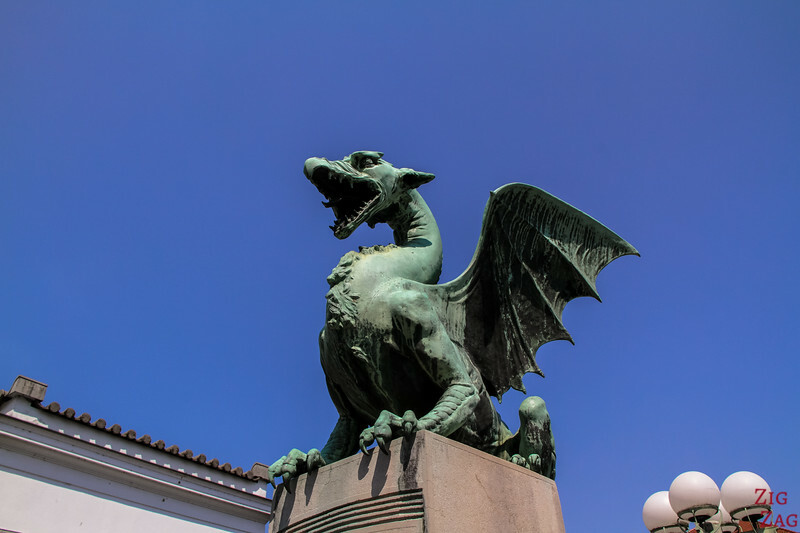 Located across the Ljubljanica River, East from the Triple bridge, It has become famous because of the 4 dragon statues that are protecting it (and are very photogenic). And for those who prefer engineering to mystical creature and great photo spots, the bridge was an extraordinary technical piece when it was built in 1900. It was one of the largest bridge of its kind (in reinforced concrete) to be built in Europe. Learn more here. 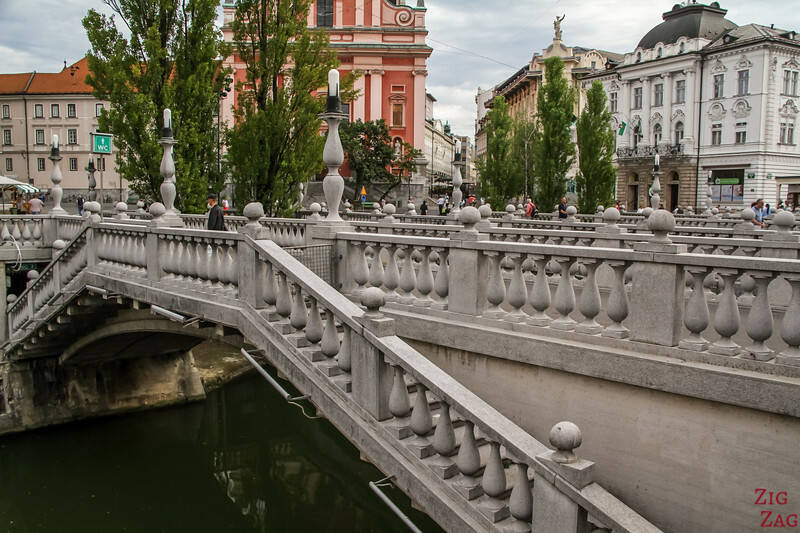 The most central bridge in Ljubljana is the Triple bridge (Tromostovje), right by the pink Franciscan church. It is one of the most difficult places to photograph!!! (you would have to be flying over it). This was design by Plecnik (the famous Slovene architect) who on top of that removed the metal railings and added balustrades and lamps. The Butchers' bridge (Mesarki most) is not the most beautiful bridges by itself, but it has some of the best views. 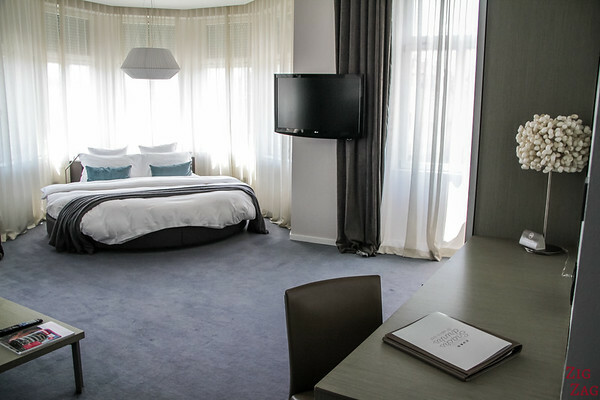 It is right by the central market and you have a great view of the colonnade. Built in 2010, it is also considered the love bridge as people are attaching padlocks (like in many other cities). It is also home to strange statues from modern Slovenian sculptor Jakov Brdar. So it creates a strange combination. 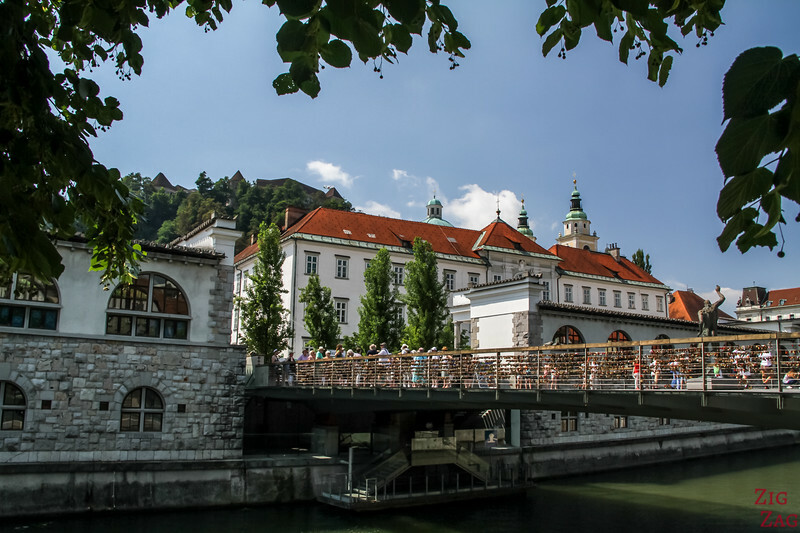 One of the most visited monuments and top things to do in Ljubljana is the castle. 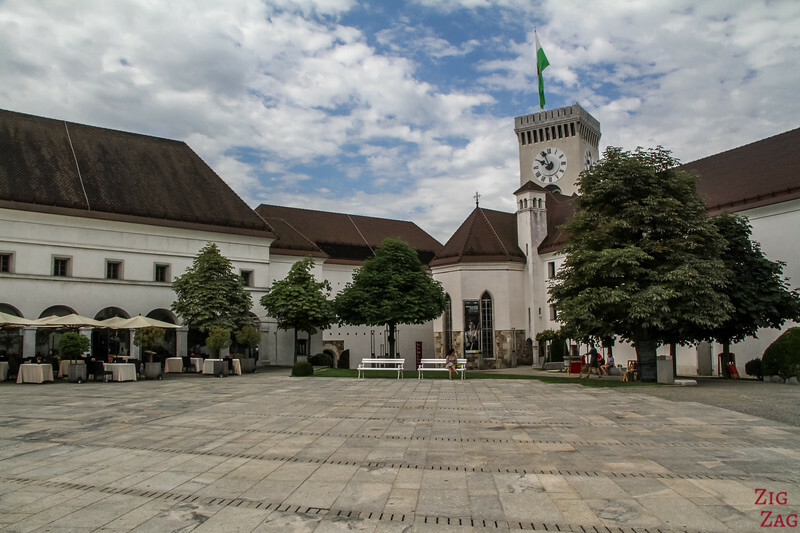 I must admit that apart from the view at the top fo the tower, I was quite disappointed by the Ljubljana Castle. 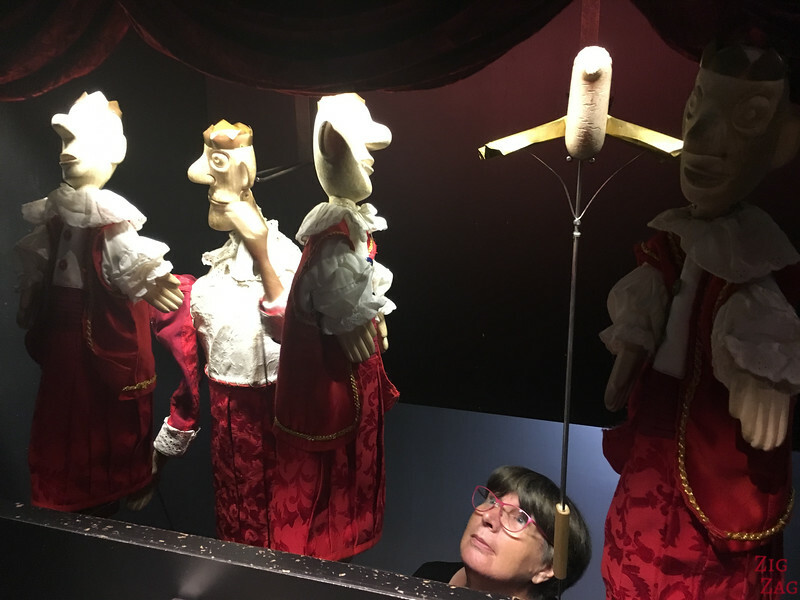 The restoration was overdone, many of the staff members were not welcoming and the museums disappointing, trying to look fancy but missing the point (appart from the puppet museum which I enjoyed). 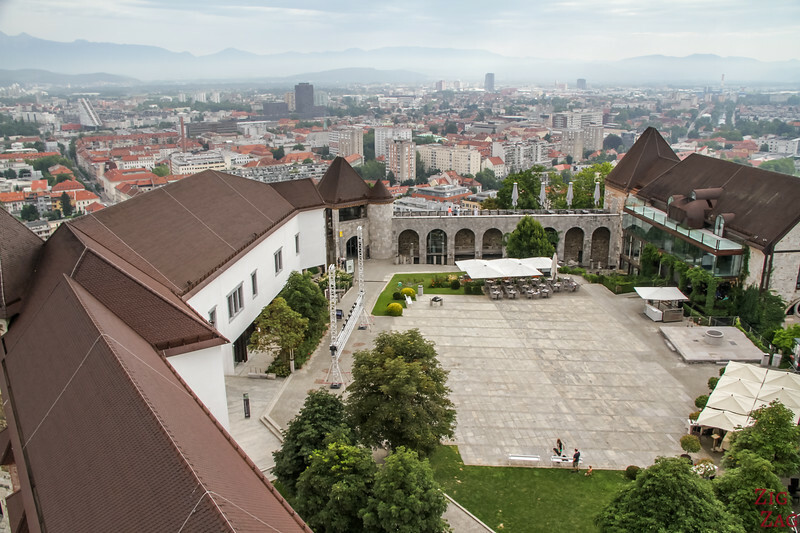 Standing on top of the hill, the castle has a strategic place to protect Ljubljana.It was probably built in the 11th century and rebuilt in the 12th century. Major transformations occurred from the 15th to the 17th centuries. The castle is depicted on the city's coat of arm with a dragon at the top. The present panoramic tower dates back to mid19th century, with an added elevation in 1982. Different ticket with different accesses are available. It is strange not to be able to walk a few steps back to see the façade of a cathedral. 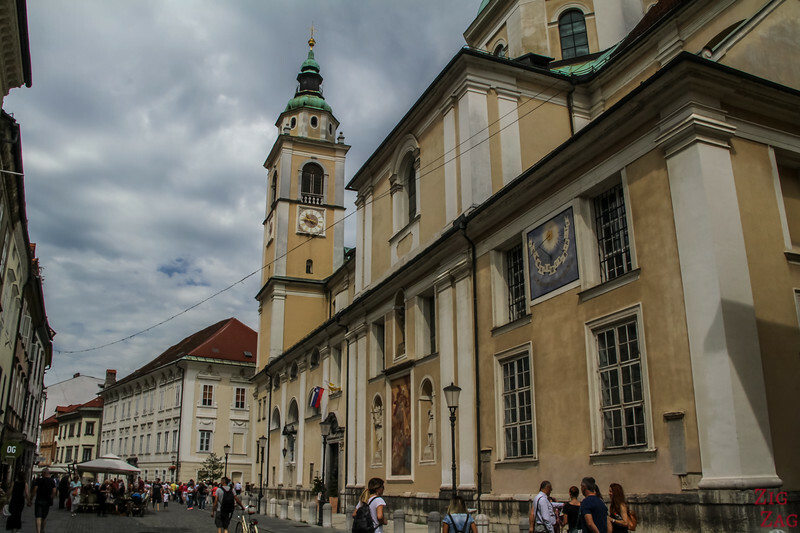 But Ljubljana's Church of St Nicholas is stuck with small street on all sides. So you can't really realise its structure and see its green coupoles. It was build over several centuries with alteration and addition. However get closed and appreciate the different part of its architecture. 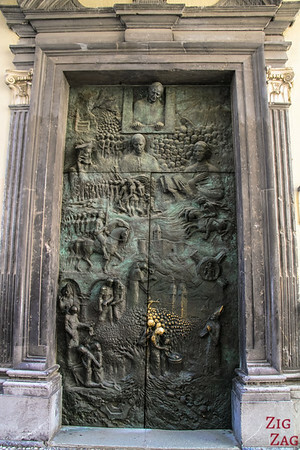 2 Bronze doors with sculptures depicting bishops and the history of Slovenia are quite interesting. Inside, the painted ceiling is majestic. 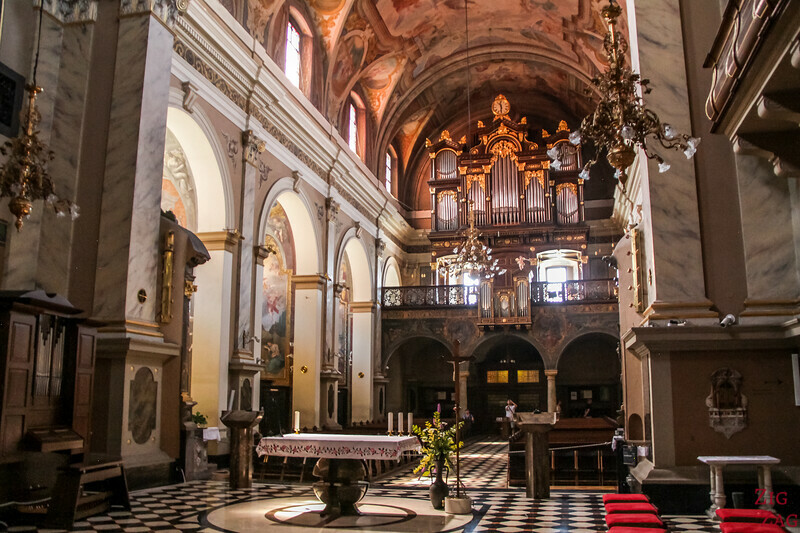 And don't forget to turn around to admire the Baroque Organ. 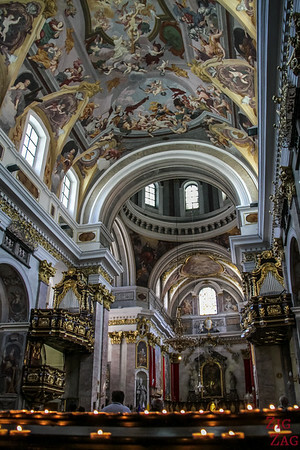 The Franciscan Church of the Annunciation is one of the most iconic sites in Ljubljana. You can't miss it! The building is pink and right near the Triple Bridge. Built in the mid 17th century, it was modified n the 19th century and damaged during the 1895 earthquake. New frescoes were painted in 1936. 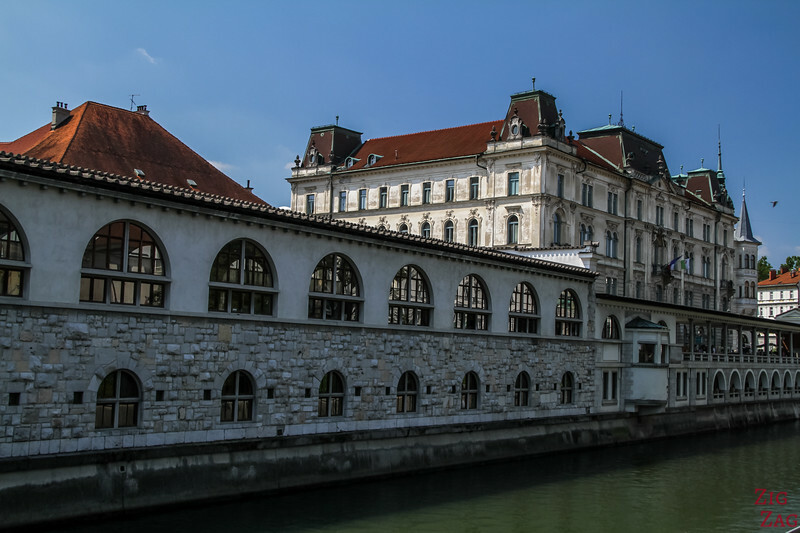 What to do in Ljubljana ? Learn more about the city by joining a city walking tour. This is a great way to understand better all the monuments and the structure of the city. 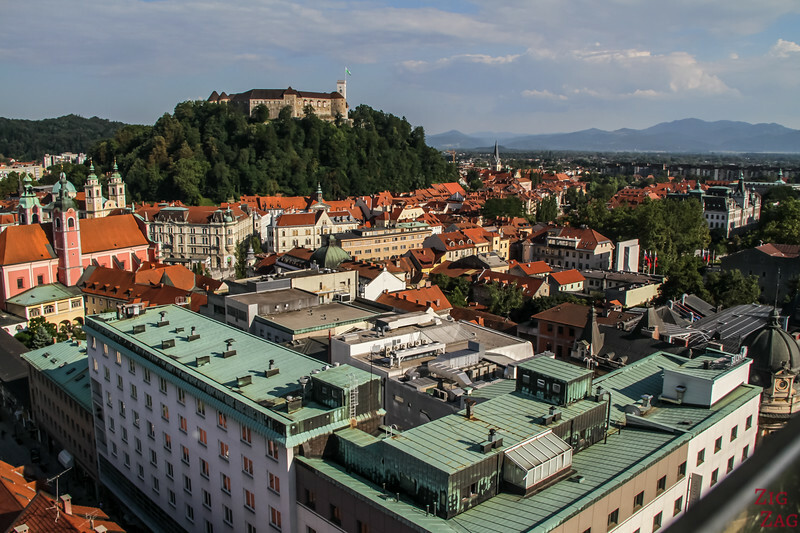 Dig deeper into the heart of Ljubljana. It includes a tour of the castle. 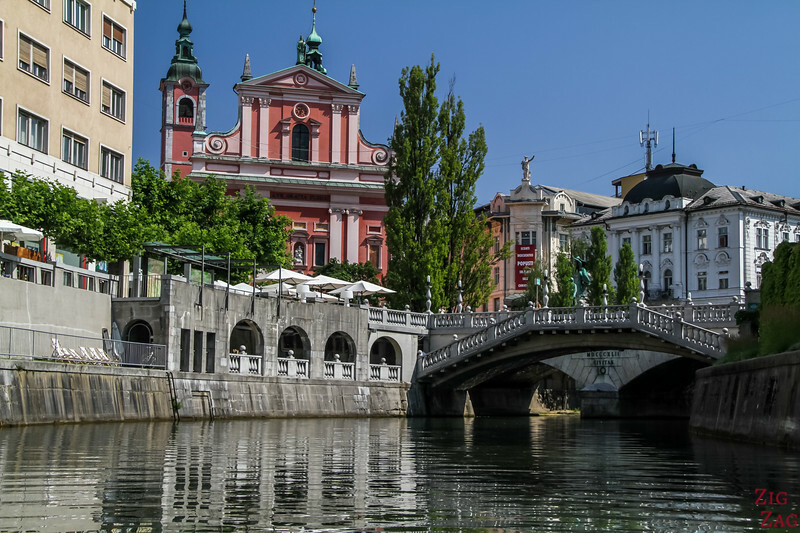 There are so many restaurant to choose from in Ljubljana and a great culture of international food with local twists. For example, I personally really enjoyed the tapas at TaBar with interesting mixes and local products. 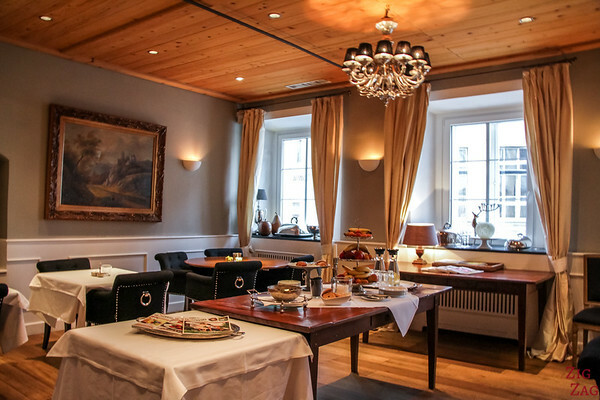 If you want to learn more about the produces and the food scene of Slovenia, it is a great idea to join a gastronomy tour. Slovenia has several regions with beautiful vineyards. One of my favorites is the off the beaten track Brda region, close to the border with Italy. 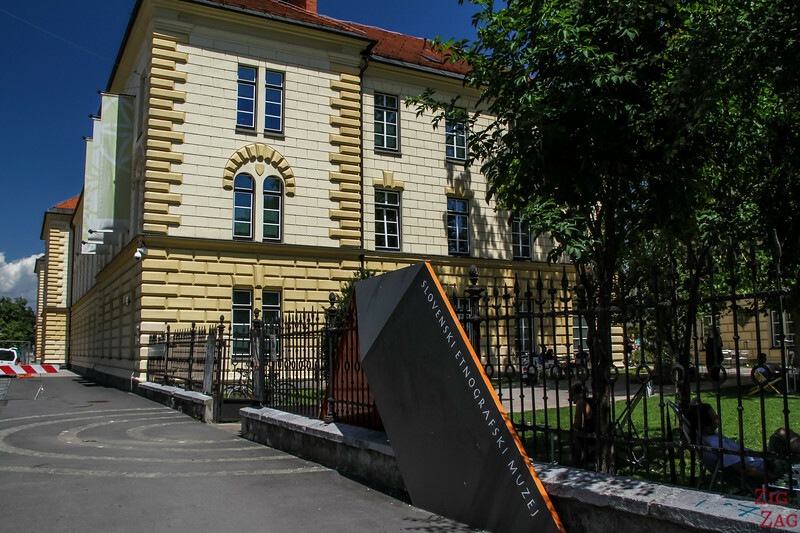 But if you can't take a road trip, you can still taste the Slovenian wines and learn more about their stories. 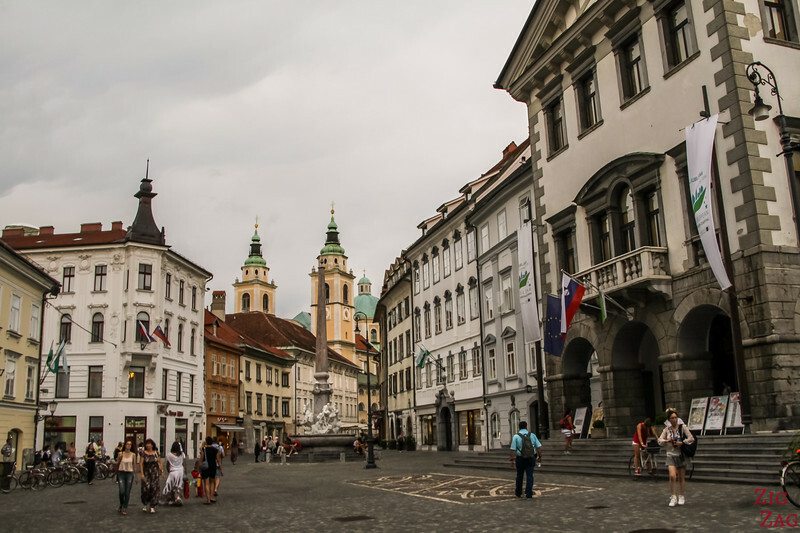 You can spend a lot of time in LJubljana without spending money. There are many old streets to explore and charming building to admire. Just go for a stroll without an itinerary, look up and find out some great gems. 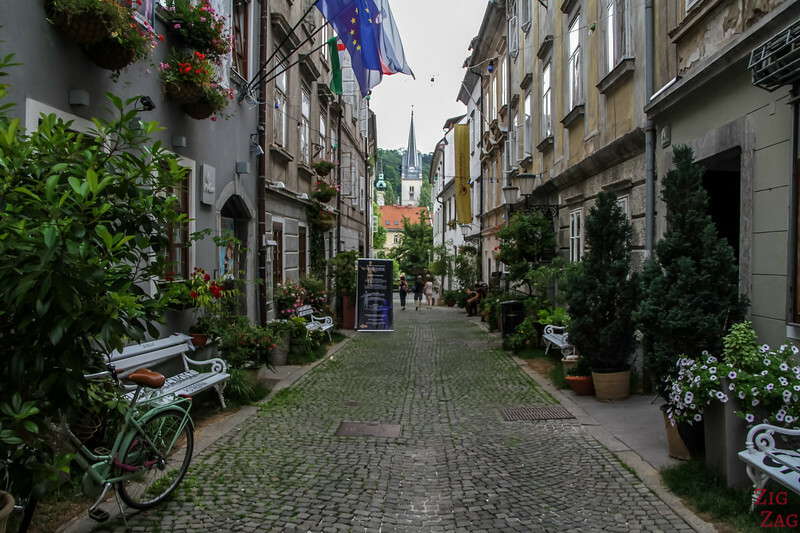 For example, I found a charming little street called Krizevniska Ulica, with painted benches and a laid-back vibe. The whole old center is pedestrian only, so it is a real pleasure to explore. 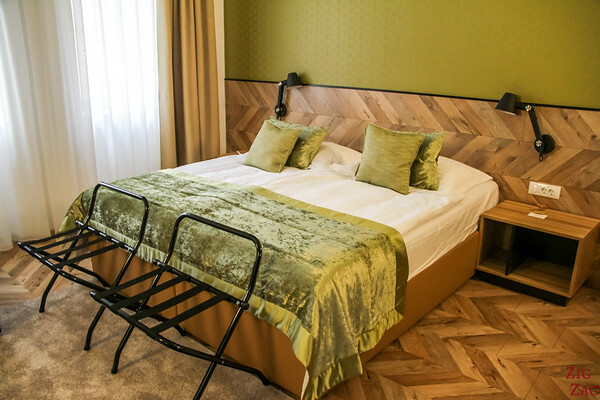 Are you looking for something more original to spend your time in Ljubljana? Fun! 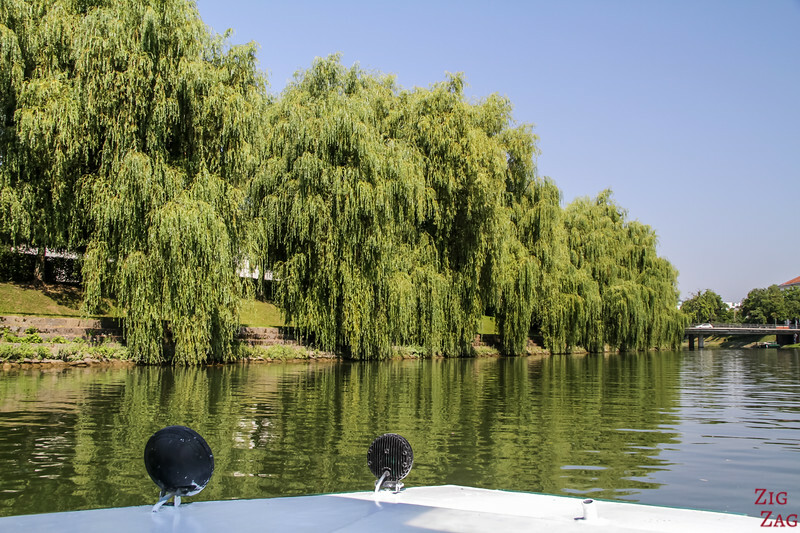 There are some very original activities and tours to do in the city. It is not often that you can find this type of tours in a city. Join a 3 hour walking tour that combines history, gastronomy and live violin music! A great way to enhance the discovery of the architecture. 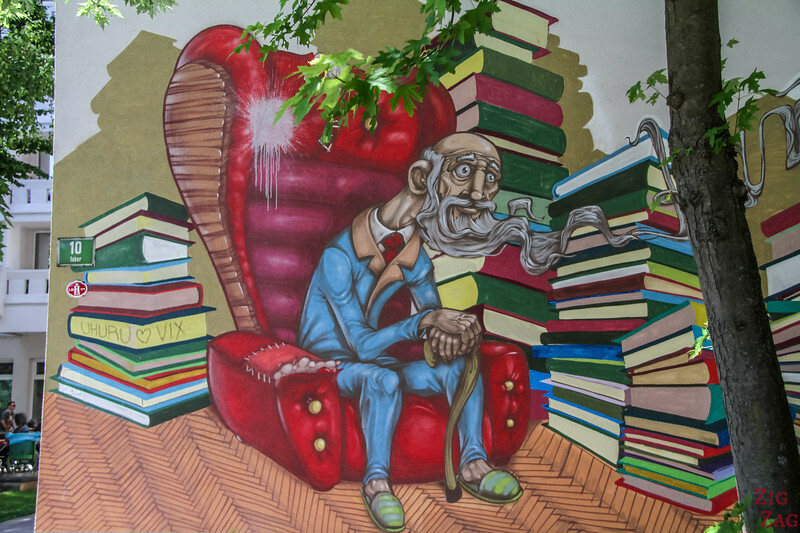 There is quite a lot of street art to discover in Ljubljana. The most famous area is Metelkova (15min walk North of the Dragon Bridge) where artists live and decorate every inches. It was a bit too much for my taste but I do like finding isolated pieces on the side of a building. 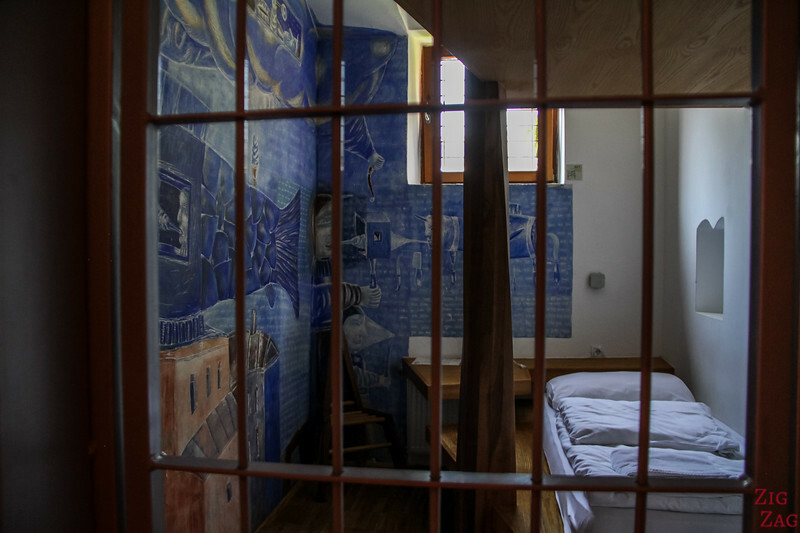 Near the street art area of Metelkova, there is an old prison that has been transformed into a hostel (Hostel Celica Art). 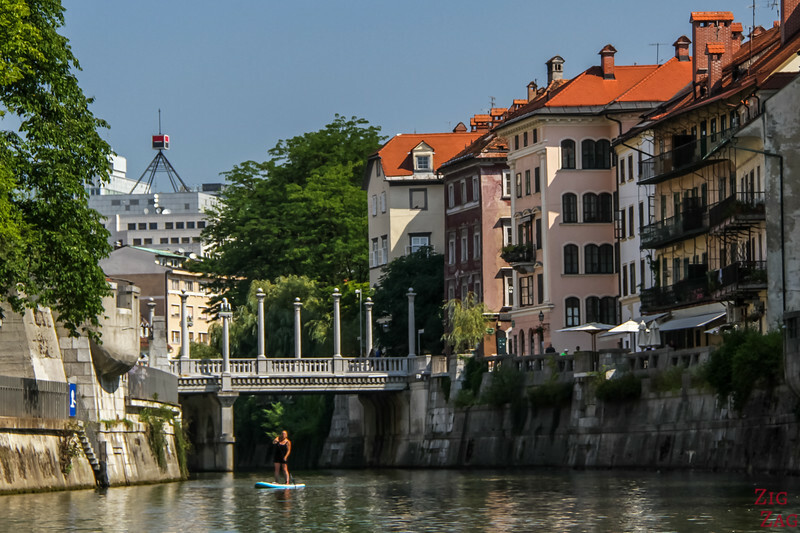 Generally speaking, Ljubljana does not feel too much like a big city. There are some large streets and the whole center is pedestrian. So you don't feel oppressed. 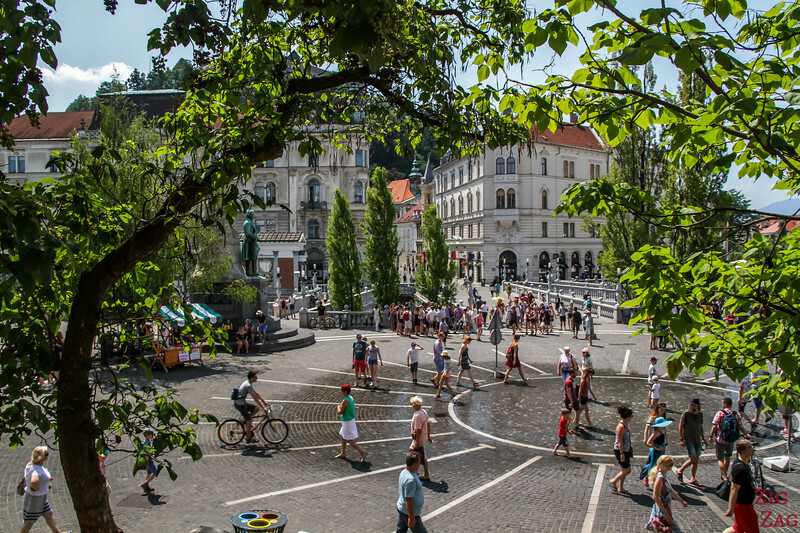 Ljubljana has a very large park called Tivoli. It was designed in 1813 by a French engineer. It covers 5km2 so plenty of grass and trees to enjoy! Below is the map of the park. From the city, you arrive to the right via an underground passage to avoid crossing the fast road. 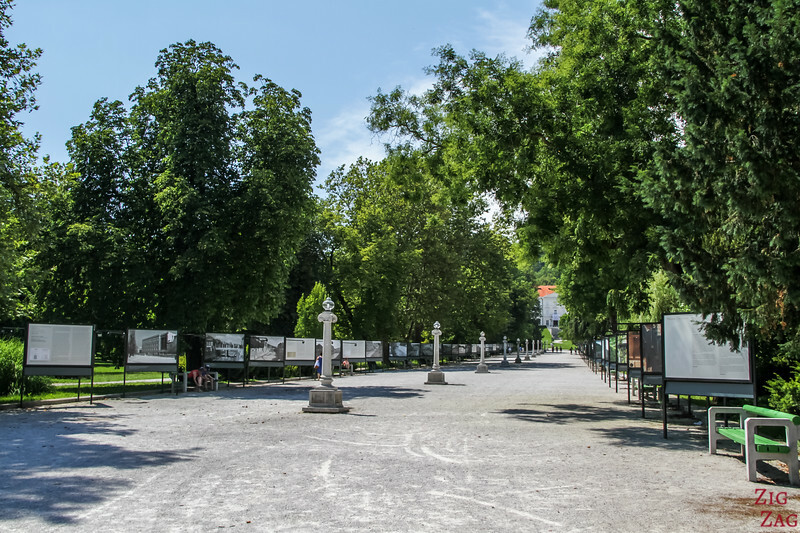 The First section is landscaped around the Jakopic Promenade designed by Plecnik. But the rest of the park is wilder with forest. 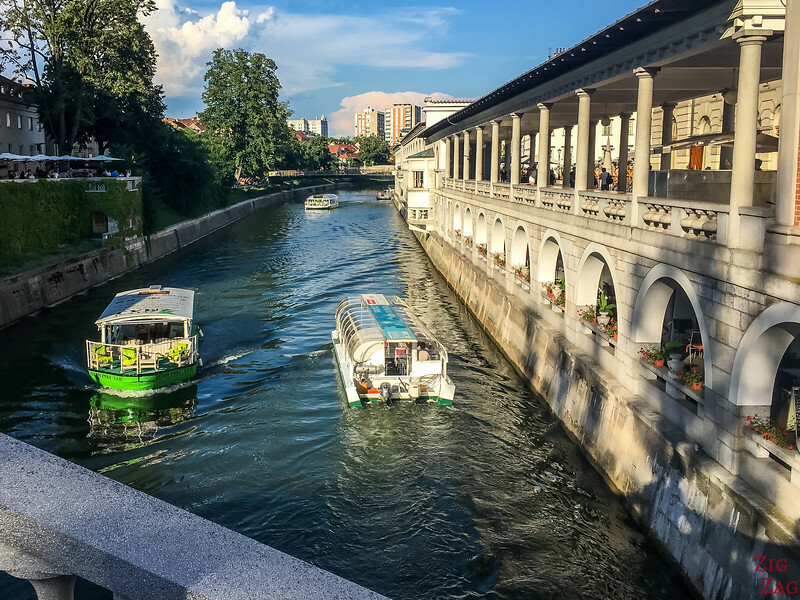 A great way to change your perspective on the city is to take a 45min cruise on the Ljubljanica river. Sadly they don't provide much information, but it is still a pleasure to glide on the water and discover more of the city. While on the cruise, you can see the triple bridge from below, which is quite fun. And then you will see the impressive dragons guarding the Dragon bridge before turning around. This is a fun place! So much to play with. 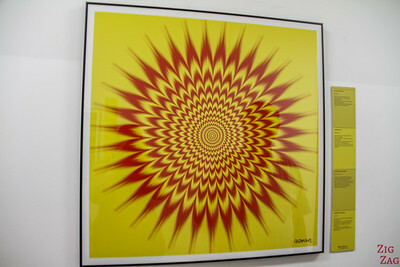 Many optical illusions with drawings or with you as the subject. 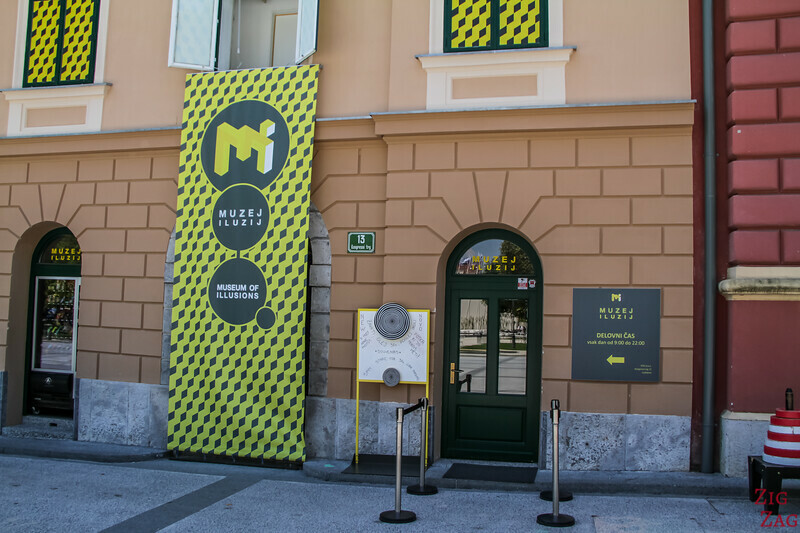 This is the main art museum in Slovenia with a great collection from the late medieval period. 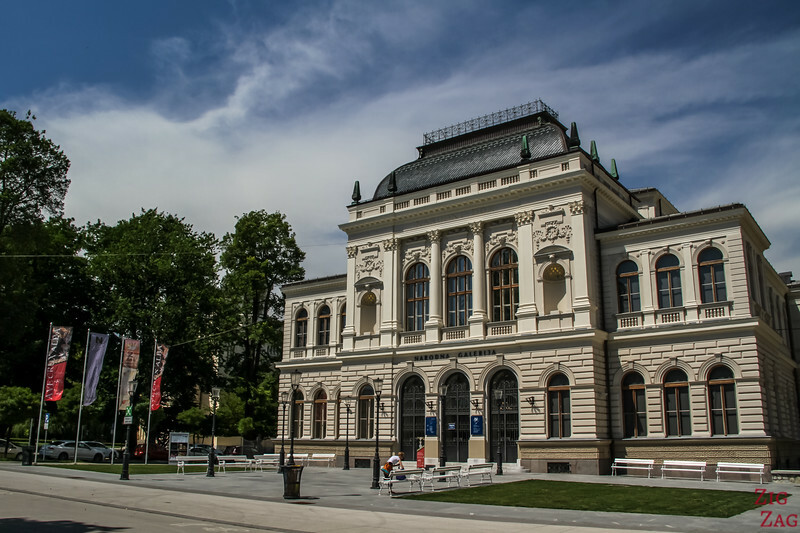 Another interesting option is the Etnographic museum. 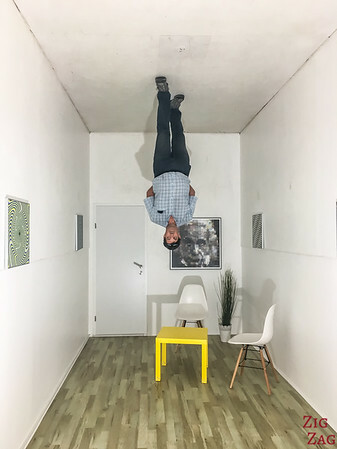 It is a cool place to hang around, and an interesting subject (to my opinion). 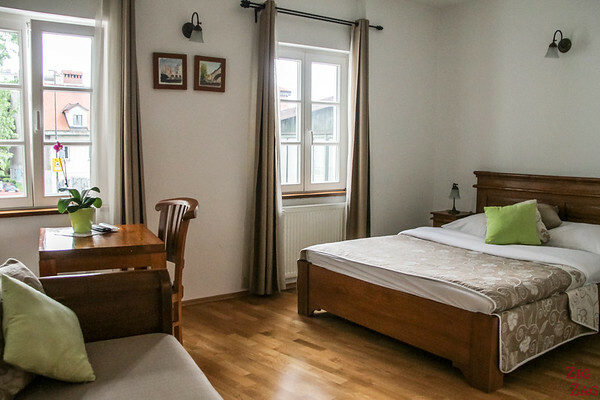 It presents traditional culture of Slovenian inhabited areas and the cultures of several other peoples of the world. 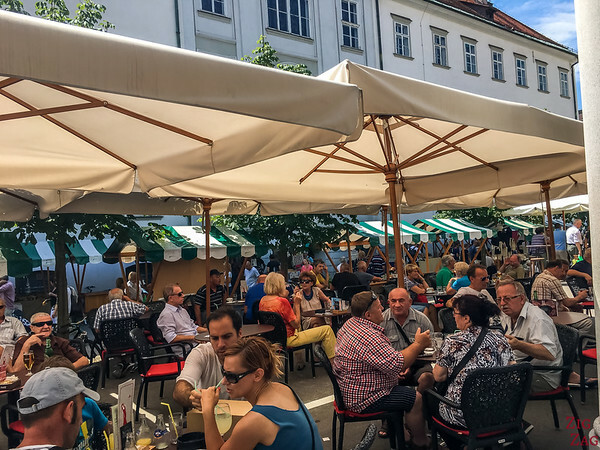 As I said, Ljubljana has a great food scene with a mix of international cuisine and local influences as well as traditional dishes. But what you will notice the most are all the places selling home-made ice creams. You can't walk 200m without an ice-cream option. LOL. 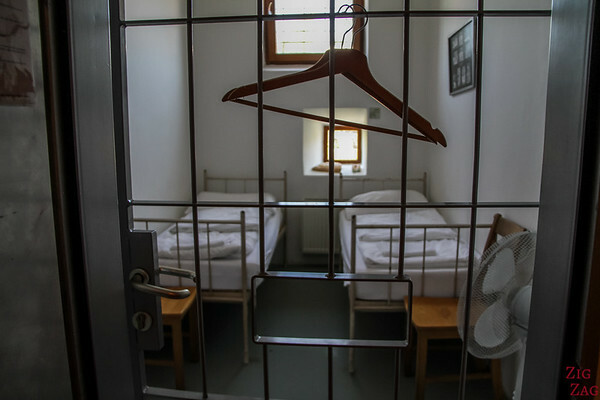 Hostel in a prison, with options to sleep in old cells. 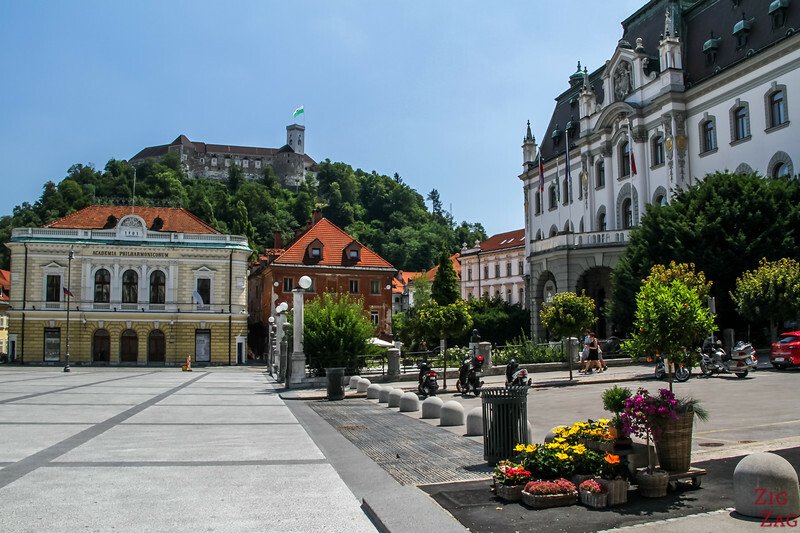 If you have more time to stay in LJubljana and want to discover some of the wonder of Slovenia without driving, you can join some day trips to fantastic locations. 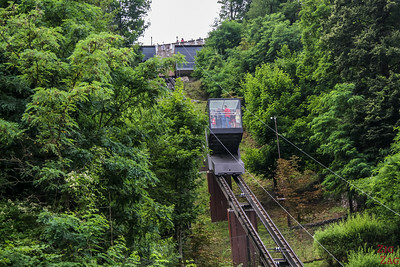 You can see my whole selection on the article: Best day trips from Ljubljana. I wish you a wonderful trip to Ljubljana!